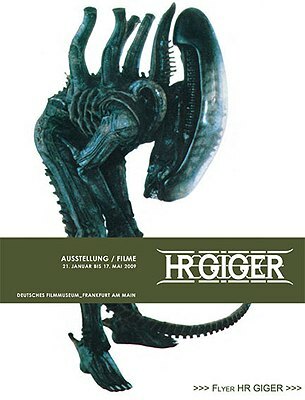 The Little Giger Page is about the art of the Swiss surrealist, H.R. Giger. It is the official supplement to the artist's own website, www.HRGiger.com, and provides information to his fans about the artist's accomplishments, his books, films, and special projects, plus the most comprehensive Database of H.R. Giger's artistic output of nearly 40 years. Please visit our recently expanded ARTICLES section, an important feature of this supplementary website where we try to maintain a complete and up-to-date archive of all H.R. Giger related newspaper and magazine articles as PDF downloads. Now you can see all the actual pages and the images as they were printed and read the complete articles in their original languages from all over the world. As many of you now have heard, "Hans Ruedi" Giger, known to the World as H.R. Giger, passed away yesterday at the age of 74. We are absolutely heartbroken over the loss of this loving husband, selfless friend, and supremely talented artist. He truly was one of a kind, committed to his craft, to his friends and to his family. His warm personality, incredible generosity, and sharp sense of humor, were in stark contrast with the universe he depicted in his art. We would like to express our gratitude to the wonderful tributes that have been written following H.R. Giger's death. These kind words and appreciation of his artistry continue to nourish and lift our hearts at this most devastating of times, and to know that his art has inspired and entertained so many people is of unimaginable comfort. 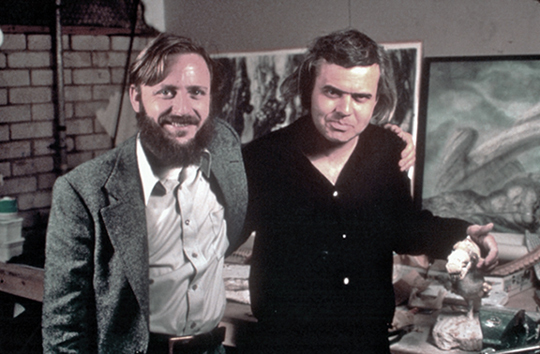 As much as Giger shunned the limelight, preferring his work to speak for him, he was greatly appreciative of every compliment he ever received and we know he would be amazed and humbled by the kindness that continues to be the subject of his eulogies. In a career with so many star-studded highlights, it is only natural that many have mentioned his world famous brainchild, ALIEN, since the news broke this morning. It was certainly a creation which Giger prized, much as he took great pride in his collaboration with myriads of music industry and film artists, since he began his glorious journey as a world class painter, sculptor and designer. 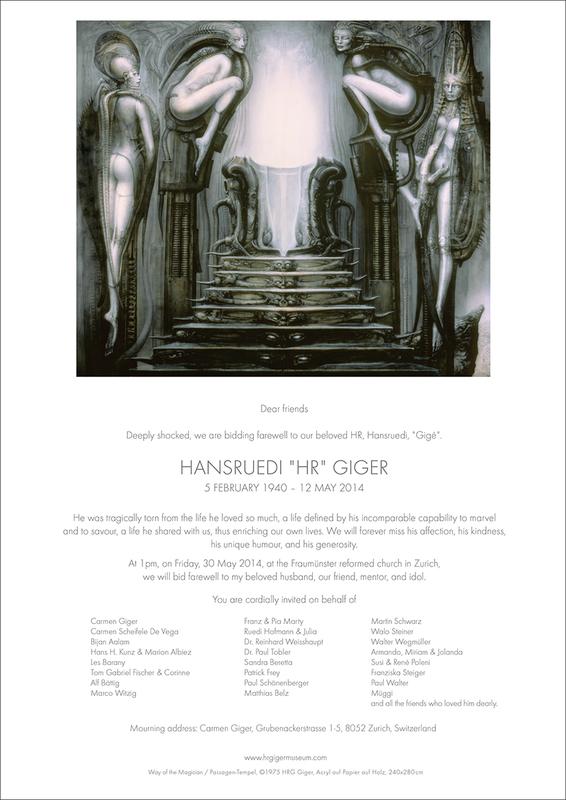 Our priority now is to support his wife Carmen Maria Scheifele Giger, and the extended Giger family, and ask that you respect our privacy during this time, so we may mourn the loss of our beloved "Hans Ruedi". An exhibit featuring H.R. 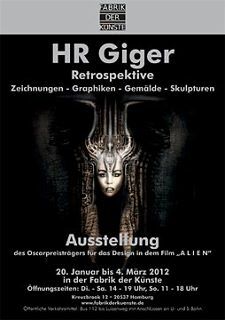 Giger's film design work will be held at the Deutsches Filmmuseum in Frankfurt, Germany from January 21 - July 26, 2009. The installation will feature original painting, sketches, maquettes, props and costumes, archival photos, and more. The films covered will include Alien, Alien 3, Species, and Poltergeist II. !!! BEYOND BAD - Missing in Prague - ELP paintings... !!! Mr. Giger wishes to forewarn all his collectors and fans that most of the merchandise sold on EBay, claiming to have been made by H.R. Giger or to be reproductions of Giger artworks are fakes, forgeries and cheap imitations. Such EBay offerings are in violation of Mr. Giger's copyright. If you cannot find the exact same item featured on one of the authorized Giger websites, or listed in the Giger Database, or via a link from one of the Giger websites to a legitimate licensor, art dealer or gallery, you will not be buying an authentic product created by H.R. Giger.